I will buy books that feature characters I like. For example: I will buy anything Jubilee appears in. I have one solitary volume of X-23 on my bookshelf just because Jubes was featured in the primary story. Haven’t bothered to buy any other trades of that series, but by gum, I have the one with Jubilee on the cover. But yeah, I will do my best to support characters I have an affinity for. So that’s why, of the few DC trades I put down money for from the New 52 era, most of them are the New Guardians series that gave Kyle Rayner a starring role (with, I believe, the entirety of the rest being the Batgirl of Burnside books because Babs is another favorite of mine). Kyle is MY Green Lantern, and he always will be. In college when I went hard into DC it was because of characters like Kyle, Wally, and their dynamic in Grant Morrison’s JLA. It’s given me complete empathy with Barry Allen and Hal Jordan fans, though, because they way I felt when Wally and Kyle were pushed aside to bring their predecessors back is, I’m sure, how many of them felt like Barry and Hal were replaced to begin with. It’s the circle of life. The wheel of fortune. A leap of faith, if you will. Antagonists: Larfleeze (which… Agent Orange. Ugh, that name), Invictus, The First Lantern, Relic, and more. Green Lantern: New Guardians is a book that sees Kyle ”chosen” by rings from every corps of the emotional spectrum while going about his Green Lantern business on Earth. Following the rings are a member from each corps as they try to find why the rings abandoned their previous owners. Kyle has no idea what is happening and is thrust into conflict with the likes of Arkillo, Fatality, Munk, Bleez, and Glomulus, with only Saint Walker believing his innocence off the bat. Kyle makes haste to OA to confront the Guardians on the matter, and he quickly finds that the once-father-like Ganthet has been reprogrammed by the others so that he would be less likely to feel and follow his emotions. 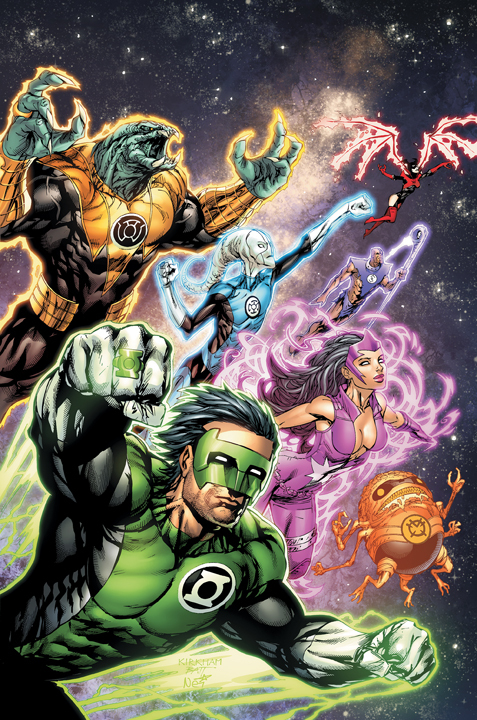 Ganthet and the other Guardians seek to punish Kyle (because in the Geoff Johns era of DC, the Guardians’ ineptitude is only ever matched by their random malevolence), and it’s not long before Kyle and his unlikely companions find themselves caught in a struggle between Orange Lantern Larfleeze and an archangel named Invictus. It goes on from there. It’s revealed that the rings finding Kyle was the doing of Sayd (Ganthet’s former love, and a Guardian who has been in the thrall of Larfleeze). Kyle then begins working with Carol Ferris to master the entire emotional spectrum so that he can rescue Ganthet from the other Guardians’ machinations, leading to Kyle becoming the White Lantern. At around that time, the other corps members drop out of the regular cast, replaced by the ongoing partnership of Kyle and Carol. It’s honestly not a great series, I don’t know what else to tell you, and that’s coming from a Kyle fan. It starts strong with the fun partnership between Rayner and the other Lanterns and Tyler Kirkham’s underrated art, but the Larfleeze/Invictus story goes a bit overlong because Invictus is just a big, yelly, angel guy without much flavor and Larfleeze gets tiring in larger doses. The problem is that after the initial arc, the art quality takes a hit when Kirkham leaves, and the story becomes directionless. The next several issues after finishing up with Invictus sees Kyle training to control all the colors of the spectrum, and as soon as he does, the story of his going to save Ganthet is shoved aside to usher in Volthoom, the First Lantern Everything up to that point feels meaningless. After all Kyle Rayner’s work to become the White Lantern so he could have the power to save Ganthet… Hal Jordan ends up as the hero of the First Lantern story, and Sinestro “kills” the Guardian when Kyle’s not even around. Just… what was the point? If there is one positive the rest of the way after that initially arc, it might be the budding relationship between Carol Ferris the Star Sapphire, and Kyle Rayner. Now, don’t get me wrong, I was not a fan of this relationship in theory—there’s no hope there as Carol is always going to be known as Hals’ gal, and Kyle collects lovers like the Williams sisters collect tennis titles—but in practice, Tyler Bedard and Juston Jordan do all right by it. The two characters have exceptional chemistry. They play off each other really well, and you can genuinely invest in them as you read. It’s just too bad their adventures while they bloom into a couple are so middling. A lot of generic space stuff and some one-off villains. Nothing is particularly inspired there. Talking Point: So I’m a big fan of the whole emotional spectrum and the various lantern corps, and I’m glad that has been such a hit. Here’s an easy one: If you were going to be selected by a corps… which one would have you? It could really be a lot better. There’s such a build for the story that Kyle is going to save Ganthet, and then… nothing. Not to say the heroes always need to win, but Rayner wasn’t even involved in the decision, so why the arc? It just loses so much steam after the first volume, and the good points (the training in the spectrum and the relationship with Carol) can’t save it.